Poverty, Famine, Evictions, examines the daily life of the rural majority, and includes some remarkably powerful pictures from the Land War of the 1880s. 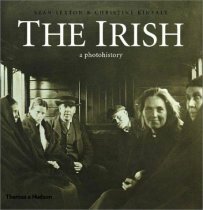 From Union to Partition features some interesting pictures of Irish troops in the First World War, as well as an extensive record of the struggle for independence. The final chapter, Towards a Modern Ireland looks at the diverse impact of economic change on Ireland over the period, bringing new forms of public entertainment as well as commercial and industrial development. The whole is beautifully presented. As a coffee table book, it would be an ornament to any home, but much more than this, as a work of history it provides the reader with a unique sense of immediacy. Old, black&white photos are marvellous. Depicting everyday life, with no acting and without retouch. Their simplicity is beautiful.